Dear Foursquare Family and Friends! To this historic 47th National Convention of Foursquare Philippines, with the theme: "PURSUE," I welcome everyone with joy and great expectation of God’s visitation, knowing the truthfulness of His promise that in the midst of two or three who are gathered in His name there will His presence be. Record shows that preregistered participants have exceeded the limit of 3,000 as early as the last week of February 2019. Certainly, it is not by numbers that we invoke the presence of God but it can easily be said of us, being one in Him in the spirit, that ours is a gathering in His name by which we gain the confidence that He will reveal Himself in our midst for us to experience once again the renewal of strength and anointing of the Holy Spirit. We are saddened with the reality that many could not come simply because we are growing, and we found no affordable place to accommodate a greater number. We’ve been to this dilemma since four conventions ago. Though a good kind of problem as some have said, but mind you, it is not that easy to refuse many who still want to come. So, to those who were literally denied participation for the reason cited above, we offer you our sincerest apology. The best that we can do at the moment is to pray that even as we join our hearts together to PURSUE Him, the same Divine Presence He will reveal to all of us, whether you are part of those gathered ones in the convention or those left scattered in your respective localities. Any Prayer Needs and Requests? 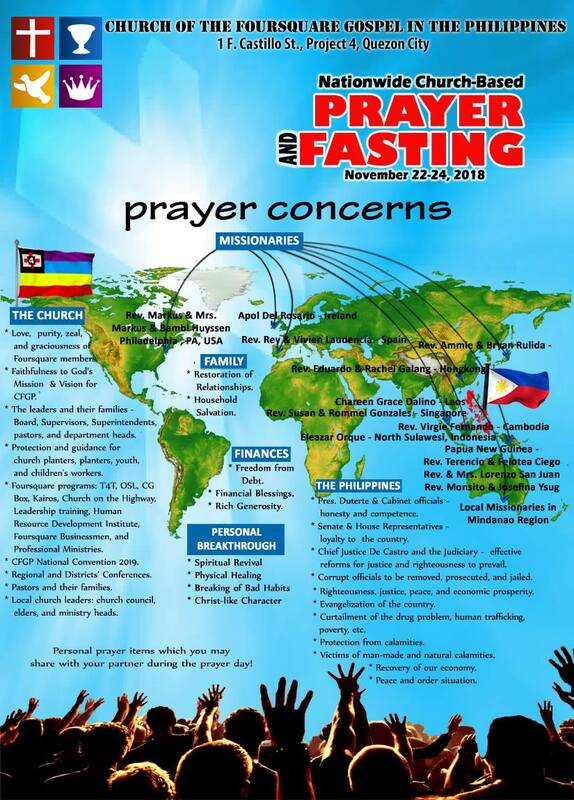 We bring your concerns to God in prayer. Please take a moment to email us your prayer request at foursquareph@yahoo.com. Kindly include the nature of your request (general prayer request, salvation for yourself or a loved one, healing, family, finances, etc.) and our team will be glad to pray for you. Be assured that your prayer request information is kept confidential. better view and to download.